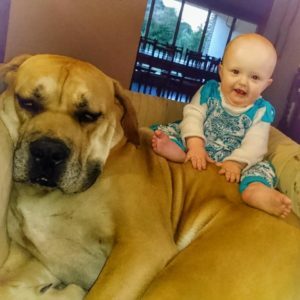 Babies who live with dogs and cats during their first year of life may be less susceptible to respiratory infections, such as the common cold. Growing up with pets is also linked to higher self-esteem, cognitive development and social skills. It also helps children develop kindness and compassion. 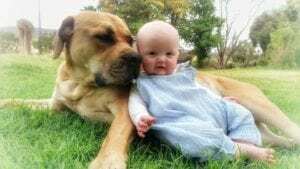 A study of nearly 400 children found that babies who lived with dogs during their first year were about one-third more likely to be healthy during their first year, compared to babies who didn’t have a pet in the home. Babies with dogs in the home were 44 % less likely to develop an ear infection, and 29 % less likely to need antibiotics than their peers without pets. Results of the study were published in the journal Pediatrics. According to the article, previous research on pets in the home has suggested that animals, and dogs in particular, may provide some protection against the development of asthma and allergies. But other studies have found that household pets may increase the number of respiratory infections in children, according to background information in the study. The study’s authors said it’s not clear how dogs might offer protection against respiratory illnesses. One possible explanation might be that the dogs bring something inside the house, like dirt or soil, that affects the immune maturation of the child, leading to more composed immunologic reactions to infectious agents later when the child comes in contact with viruses and bacteria, researchers say. The authors say they wouldn’t tell parents whether or not to get a pet but that the study’s findings suggest that there is no reason to avoid animal contacts because of fear of infections, at least not respiratory infections.